Usually when the phone rings in the wee hours of the morning, it's bad news. Not so when the Nobel Prize Committee in Sweden makes their congratulatory phone calls. Researchers Richard Axel, MD, a professor at Columbia University (New York, NY) and Linda Buck, PhD, a professor at the Fred Hutchinson Cancer Research Center (Seattle, WA) each received a wake-up call on October 4, 2004. Their groundbreaking research about the genes involved in the sense of smell -- and how that information is transmitted to and translated in the brain -- is being honored with the 2004 Nobel Prize in Physiology or Medicine. The prestigious award, the highest honor a scientist can receive, comes with a $1.3 million check that will be split between Dr. Axel and Dr. Buck. Axel and Buck tackled an area of research in which little was known previously: how the sense of smell, or olfaction, works. The numbers generated from their work speak for themselves. There are more than 1,000 different genes involved in the sense of smell; this, then, is the largest gene family known in the human genome. This represents 3% of the human genome, demonstrating how vital our sense of smell is to our survival; we need to detect food and discern if it's still edible (not rotten or poisonous), for example. Most animals use smell to find food, avoid predators and interpret their environment. The two researchers share a common past: Dr. Buck did her post-doctoral work in Dr. Axel's lab in the early 1990s. Both researchers are Howard Hughes Medical Institute investigators, an honor that recognizes their innovative research with financial support. Post-doctoral work (1-6 years in an established scientist's lab; some researchers complete one or more "postdocs." The sense of smell results from a complex interplay between the nose and a part of the brain near the front called the olfactory bulbs. Within the skin (epithelium) inside the nose - are you sitting down? - are up to 12 million olfactory receptor neurons; each neuron sends a single dendrite to the epithelium. The dendrite houses 5-20 hair-like projections, called cilia, that contact the mucus. The cilia contain the odorant receptors. The other part of the neuron sends a single axon through the bony plate above the nasal cavity to the olfactory bulb. 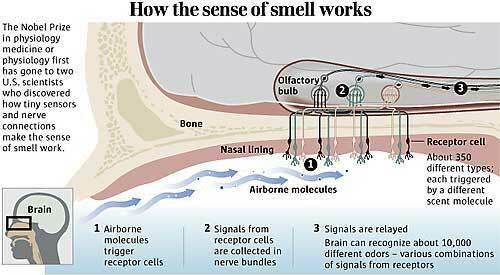 Once an odor is detected, an electrical signal travels along the neuron straight to the olfactory bulb in the brain. From the olfactory bulb, which is like the switchboard for smell information in the brain, the information is routed to other parts of the brain, including limbic areas. The sense of smell, therefore, is linked strongly to memories and emotion. By using chemicals in the lab to trace the pathways involved in smell, the researchers have been able to map how certain smells trigger the olfactory receptors, and how the information is conveyed by neuronal signals to the olfactory bulb and on to other parts of the brain. How do mammals detect so many different chemicals as having smell? How does the brain translate information (about smell) into perceptions? Buck chose a novel approach to solve the mystery of how the nose-brain system recognizes the thousands of odor molecules (called "odorants") floating around us in the world. The question was: Did many very specific receptors detect the odorants, or only a few receptors, working overtime? The approach was: Search for the genes encoding receptors found only in the nose, instead of searching for the receptors themselves. Buck's former mentor, Axel, called this approach "an extremely clever twist." The research to solve this receptor mystery borrowed clues from other studies on receptors. Clue one: Many receptor proteins have a similar structure: they cross the cell membrane seven times, creating a zig-zag shape that resembles a snake. Clue two: These proteins often interact with another type of protein, G-proteins, to transmit signals to the inside of the cell. Clue three: These proteins often share stretches of DNA in common. These clues helped Buck to design probes (think of a fishing hook shaped for a certain fish) to identify these sequences in rodent DNA. The better you know what you are fishing for, the better you can design the "hook" to catch it. By carefully designing the "hook," or probe, Buck saved years of work. Once genes had been identified in rodent DNA, a similar approach was used to fish out the genes in collections of DNA from other species such as humans, mice, dogs, catfish and salamander. Buck is expanding her research on odorant receptors to other types of receptors, such as those involved in bitter tastes, sweet tastes and pheromones. Pheromones are chemicals produced by animals to signal to others in their species. The first pheromone, identified in the 1950s, was an attractant signal for silkworm moth mating. Research on insects, though, is much easier than on humans, and the topic of human pheromones is controversial. Don't invest in that pheromone-enhanced perfume yet. The jury is still out on whether you can improve your attractiveness by exuding certain chemical signals. Animals have a vomeronasal organ (VNO) that responds to pheromones, but no such organ has been pinpointed in humans. Axel has noted that if humans have one, it's most likely disrupted by plastic surgery in those who have nose jobs. "In my discussion with her, I was struck by her openness to different solutions to basic problems in neurobiology. She was willing to embrace a theory different from her own as long as it was based on careful research and good science. She was also extremely creative. I had read the literature pretty thoroughly before I met with her, and still she opened my eyes to a number of ideas about the molecular biology of smell that had not been explored by other scientists." "...his research solves the puzzle of how we translate sensations around us into knowledge that is key for our survival..."
"(Their) experiments represent the highest form of creativity, scientific discipline and scholarship." Perfume makers claim that they can identify as many as 5,000 different types of odorants. (Kandel, et al., Principles of Neural Science, 4th Ed., page 625). Dr. Linda Buck is the 11th woman to receive a Nobel Prize in sciences in the 103 years the prizes have been awarded. Press release with a summary of Dr. Axel and Dr. Buck's research on olfaction.